Looks Good from the Back: Adrien: I mean it. So, what is your opinion about mixing black and brown? Do you have one? Do you care? Oh God, they would think I was going to a funeral every day. My closet is packed with black. In fact, I just bought a dress on my lunch hour and was debating between the fuschia and the black. What did I go with? The black. I'm nothing if not consistent. That's one of those dresses I see on the hanger at Target and say, "Wow! That's the greatest dress I've ever seen!" Then I put it on and note that I look like a bag full of big fat ick. It looks *great* on you. How come there aren't more deep v-necks that aren't also wide v-necks? I'm tired of having my bra straps show because the v is so damn wide. 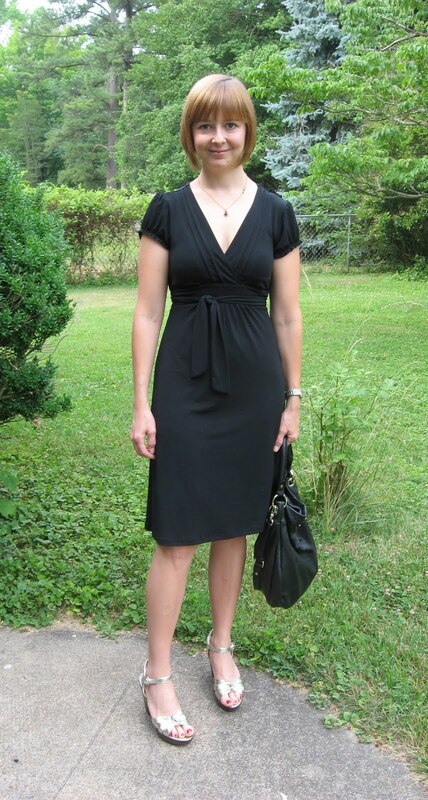 Plus, the deep v is flattering and narrows the shoulders (which is something I really need). See, and I'm always looking for something to make my shoulders look wider! Wanna switch? I have a hard time with the deep-v mainly because I always feel like I'm going to expose myself accidentally. Thank god for teeny tiny safety pins. I don't often mix black with a dark brown unless they are already a part of a print but I think black with a lighter brown or tan can be really smart together! I'd switch any day. I was a swimmer and have a broad back and massive shoulders. But, sorry, all the former muscle has long since turned to lard. A few posts behind, so playing catch-up. Also, my first comment on your blog, so yay for that. On to my point: I do not mix browns and blacks. I have a pair of pants that I can't decide is more brown or more black, and trying to pick the right shoes is IMPOSSIBLE. Also on the "no" list for me: pants that aren't black, brown, grey, the occasional khaki, or jeans. CERTAINLY no patterns. I have one skirt that's plaid. That's about as exciting as I get. Hi Meghan! Thanks for commenting. I kind of agree with you on the navy/black thing but I don't actually love to wear navy anyway, so it hasn't been a big problem. That dress looks FABULOUS on you, and I want it ... is it still at Target now? I bought it a couple of years ago, but I think they come out with a similar version every year, so you might be able to find it still.